Review: "Why Choosing Genesys PureConnect was the Best Decision we Made in 2018"
PureConnect has proven to be the right choice for our company in bringing together functionality that typically exists on multiple platforms and doesn't play well together. Moving off of our Avaya PBX in 2018 has positioned us to exploit the latest communication technologies. Once limited by our platform, using PureConnect has provided us so many options that our limitations today are tied directly to our own creativity: if we can dream it, PureConnect's features and open architecture allows us to do it. Out of the box with no real strategy changes, our contact center found itself much more efficient. Over the past year, as we have started introducing Omni-channel strategies, self-service IVR, real-time analytics, smarter call routing, etc., we are learning just how much more can be achieved-- and we're just scratching the surface. Integration with our in-house developed contact compliance system looked to be a large undertaking: 100% of all outbound calls are not permitted to launch until PureConnect receives permission from the compliance system. The system tracks historical call data and manages business rules based on client and regulatory requirements. Using handlers and the IceLib API made this project much easier than we had anticipated. One of our best investments was the training and certification of our software developers. I love the fact that Genesys invests as much as it does in R&D. I am confident that Genesys will continue to be an innovator in the communications space and will continue to support PureConnect. The largest frustration for our company is that Genesys is growing so quickly that they appear to often have trouble handling inquiries about new functionality: their marketing team does a fantastic job wetting our appetite; however, to receive additional information or schedule demonstrations (ex. "Build-a-bot workshop), it can take a lot of follow up/escalation. Would I recommend PureConnect to others? I already have. PureConnect is a single platform; therefore, everything works well together. With other solutions, we have experienced communication challenges between our core phone system and predictive dialer, our call recording solutions, our speech analytics solution, etc. With PureConnect, those issues are 100% solved. We often like pushing things to the limits. We have experience writing custom software solutions with Avaya and Asterisk (FreePBX). Using PureConnect's handlers and IceLib API has been a total game changer: we have gone from taking an R&D approach trying to find a way to do something to having multiple solutions available to us to accomplish our goals. The design, training programs, and documentation have been very well received by our software development team. Blending multiple communication channels and being designed to accommodate whatever is coming next has addressed our current needs and has given us confidence that PureConnect will continue to serve consumers in the future. WFM does not handle both inbound and outbound. It's the one component that needs to be provided by a third party. There is not enough sales support to handle requests regarding new functionality. To get basic information and/or demonstrations can take time and effort. Tracking changes would be a good feature to add (perhaps with rollback functionality). I think PureConnect is best suited for an organization that is looking to improve CSAT and reduce expense. It may not be the best choice for smaller companies that don't have a lot of communications traffic. Genesys PureConnect Review: "Mixed Bag"
Genesys PureConnect is currently being used by multiple departments within the organization after starting out with one department. The platform addresses the need for our organization to be able to communicate will with our customers with our given organizational structure which includes multiple sites in multiple countries as well as a contingent of home based customer service representatives. Where Genesys shines is when flexibility to make changes is needed. An example that stands out is a significant weather event drove extremely high call volumes into our call centers. On the fly we were able to make routing adjustments which would overflow calls to representatives with availability which provided a much better customer experience. Genesys PureConnect Review: "Great contact center "One stop shop" solution from Genesys"
Genesys PureConnect (formerly CiC CaaS from Interactive Intelligence) was selected as the prefered contact center solution for Carl Zeiss in 2013, after a comprehensive vendor selection process. The solution has been rolled out to some of the larger contact centers within our organization, and further sites are still in the pipeline for implementation. Our telephony platform is Skype for Business and PureConnect is used for sites with a need for additional contact center functionality. We wanted a "one stop shop" provider that can provide all CCC features needed in one solution with minimum of "add-ons'. We needed a solution that could integrate with multiple telephony environments & separation of contact center and telephony investments and roll-outs. Partnership with Microsoft for UC, including joint product roadmaps and tight product integration – Hassle free upgrades. Recognized by trusted industry experts (Gartner, Frost & Sullivan etc.). Cost is a hindrance for utilizing Genesys products and services, especially for smaller sites and smaller teams. The tools is sofisticated and advanced, and that's great, but it would be good to have a "Basic" license with a lower cost that could be used for smaller teams with limited requirements. Each individual implementation can be cumbersome and requires substantial investment and dedicated resources. We are happy with the solution and the functionality. It is well suited for mid to larger contact centers with a demand for a single solution that can cater for all needs within the contact center area. The product development pipeline seems to be well geared for new and upcoming technologies, even if the core product has been in the market for a long period of time. The solution requires skilled key users and administrators and can be costly, especially for smaller teams and organizations that will roll out the solution to distributed sites. Genesys PureConnect Review: "PureConnect, a brief history"
PureConnect is our primary VoIP phone system as well as our call center solution. We are not a very custom solution, considering the amount of users/stations we have and the limited amount of support staff. We do occasionally use services like Dialer, Recorder, etc, but not as often as we'd like. We also actively use Scheduled Reports, Web Client, etc. From where we came from in 2009 (old Nortel PBX's), the call center experience has vastly improved. As we introduce technologies, like web/software clients, to users, we seem to get decent feedback as well. Customization. There is a real gap between what is included and manageable with the product (with intermediate exposure) and what forces detailed handler changes. Many companies include conversion programs that make some of this easier. Sample configurations (templates) that could be explored and easily implemented as potential add-on/solutions. A more user friendly recorder interface. We have worked through most of the initial snags that come with upgrading from PBX. Most of them are process changes that we need to embrace and communicate. In that capacity, it is working well. There is sometimes a frustration knowing how powerful the system can be and not being able to access that power. This is a staff limitation but also, partly, a system limitation. If you have the staff and budget to support some of the preferred customization, it's a great solution. Genesys PureConnect Review: "A stable dialler and telecom solution for over 15 years"
I've been working with the Genesys PureConnect product and dialler in our organisation as well previous organisations. Our whole UK organisation is moving toward this platform. We use the dialler integrated with Genesys Latitude for debt collection. The product offers scalability and is feature rich and can benefit our organisation on a wider scale, offering a stable platform. The solution can grow and shrink with the size of the organisation. The solution seemless integrates with our Latitude platform. The integrated Analyser is not very good and to manual to tune and maintain. The workforce management should integrate better with the outbound dialler. More out of the box plug-ins for Workforce Management systems. Genesys PureConnect Review: "Overview on Genesys"
We currently use Genesys PureConnect in any department that has phone calls. It allows us to route calls as needed and provide us with most of the data that we need. I really like the ease of getting the data I need in minimal time. I think that working with customers more in regards to custom reporting would be nice. It makes it difficult that custom reporting is an additional cost on top of what you already pay. When we first started with Interactive (now Genesys) we were unhappy with deployment and the relationship. They have recently matched us with a point of contact who really listens to our needs, follows through, and is there to help build our relationship. I appreciate that we finally have that point of contact. Genesys PureConnect (formerly CiC CaaS from Interactive Intelligence) was selected as the preferred contact center solution for Aetna in 2012, after a comprehensive vendor selection process. The solution has been rolled out to some of the larger contact centers within our organization, and further sites are still in the pipeline for implementation. Our telephone platform is Skype for Business and PureConnect is used for sites with a need for additional contact center functionality. CX Insight makes it easier to define and track KPIs and create your own modern, interactive dashboards for real-time monitoring and that makes it easier to achieve desired business outcomes. Widgets-let you more easily deploy and use chat capabilities. You don’t have to write code to customize and personalize these features. 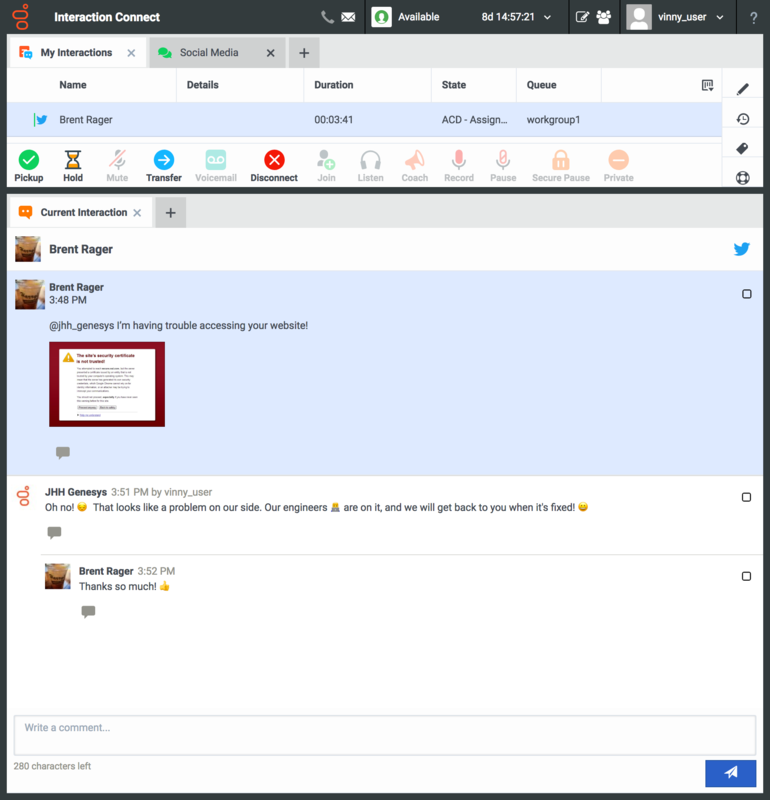 Launch chat widgets on your website to enable chat conversations with just a few configuration settings and the push of a button. 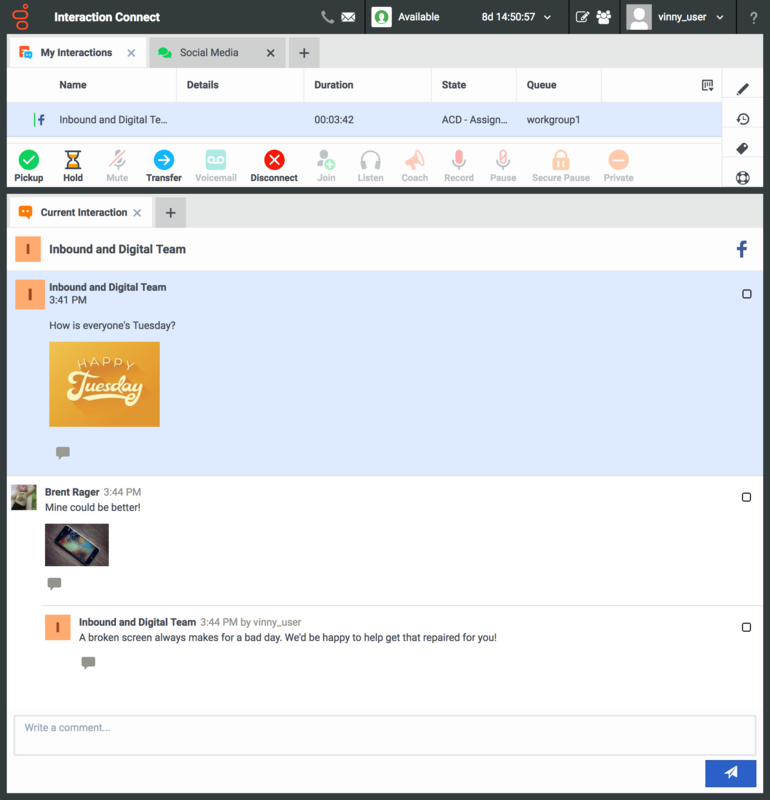 Modern Interface places a priority on building out a single, modern all-in-one interface to provide users with more flexibility and ease of use. External chat (customer to an agent) is currently poor, with very basic and limited experience. The internal chat is much more feature-rich but is only used between system users. Hands down, the ease of training new agents and getting them up and running is my number one. Also, I have transitioned from 3 separate systems for outbound, email/chat and IVR and now all of my agents are in 1 system AND can communicate with each other! We have a much more customer-centric experience for our customers with better flow and getting them to the person who can help them the most without asking them to call a different number. We are also able to house all supporting documents within the software, so we have cleared cubicles (which, let's be honest, are already small to begin with) of training binders, updates, FAQs, scripts and other resources. We were also able to move to USB headsets, further saving monthly land line expenses as well as improving sound quality for both the agents and our customers. Ease of scalability is one of the reasons we went with PrueConnect as we were maxing out and having a difficult time going up/down in seats. PrueConnect is agile, our previous option was easy to add, difficult to remove. I find the Resource Center helpful and I am able to add or change things within PrueConnect through the step-by-step directives. I also really like that there are improvements being made daily to PrueConnect (weekly release notes) and it shows the proactive stance that Genesys takes with the product and not waiting to make annual overhauls to the product. We use PureConnect in all our call centers, we have over 298 agents. It is not being used by some of the back office staff and the employees in the branches. It addresses the problems of recording calls, IVR, member identification, etc. We are now looking into adding 3rd party software for voice bio-metrics, automation, and AI IVR. Reports, certain pieces are segmented into particular reports and/or certain areas. You can't even piece it together in the report builder. Random problems that seem to have no cause, baffle you, and then fix themselves. It is fantastic in call centers as that is what it designed for. It is not so useful for departments like HR. We use the Genesys PureConnect system for our contact center to provide ACD routing of customer calls. We also utilize the Interaction Process Automation feature to enhance our internal processes and streamline our daily work. With the Genesys PureConnect system, we are able to intelligently route customer calls to the most skilled agents, this provides the best possible experience for the customer and the agent. Intelligently routes customer calls to the most experienced agents. Interaction Process Automation allows us to streamline business processes and manage the work. Call recording allows us to perform quality assurance on our agents to ensure they are handling the customer the best way possible. Ability to write custom handlers to extend the out-of-the-box functionality allows us to increase efficiency of handling business processes. None, this product does everything we need it to do and so much more! Genesys PureConnect provides excellent ACD routing of customer calls. The Interaction Process Automation feature has improved our business processes and streamlined the work necessary to complete all tasks. The ability to write custom handlers has allowed us to automate business processes and increase our agents efficiency. The broad out of the box functionality of Attendant, has allowed us to improve the routing of customer calls to the best suited agents. PureConnect is our contact centre solution. I t allows us to manage customer interactions throughout our organisation. We are developing the strands of the product most beneficial to our business in our contact centre environment, with a view to rolling it out to other touch-points in our customer journey. The solution works well in our Contact Centre environment and in areas where there is direct customer contact. Genesys PureConnect Review: "Do not fall asleep, you've got a good product!" We are a contact center, so we use internally the solution but we also offer services based on the platform for external customers. So we have external users of the platform handling various types of interactions and we have a portfolio of automated services running on the platform -- self services on the IVR and Bot on the Chat. One of the most important problems with PureConnect is the extremely conservative pricing model. For this reason, it's an appropriate solution for recurrent and stable activities. But once we speak about volatile, specific, creative solutions, we need to look to solutions like Twilio. Genesys PureConnect Review: "Hey, PureConnect, please catch up PureEngage"
My company is using PureConnect only for contact center requirement like ACD, Recording, and Reporting. So far Customer Service, HR Experience and Finance Experience Team is using PureConnect. Better IVR experience. Calls are recorded for quality purposes and reporting for supervisor reference. All subsystems integrated in one server. Less server deployments. Organized Technical Support and proper escalation process. Lack of social media integration to PureConnect. Lack of automation, AI bot, AI voice bot. For traditional contact centers that require ACD calls, callback and email is well suited. For companies that require omnichannel integration, PureConnect is less appropriate. Genesys PureConnect: "PureConnect Review as a Gold Partner Support Manager"
I am working as Support Manager in CCR, which is a gold Genesys Partner. Lots of our customers are asking for Naturel WebRTC support. Support was much faster and better in ININ times :). When we create a ticket, we were receiving a meaningful reply in 1-2 hours. Now it is taking weeks. I really could not find any others! Since PureConnect is all-in-one application, easy of use with various client applications and stable, we can use it all as >= mid customers. For the customers who has few clients (agents & business users) like <30, we cannot position it since main server license is expensive. Maybe Genesys can create a new mini server license for these kind of customers. PS: Since internet connection is not as stable as in US or Europe and some government regulations, customers do not want to use PureCloud and look for on-premises solutions like CIC. Genesys PureConnect Review: "PureConnect, the contact center communication software"
PureConnect is used by our whole company (800 users) and we've implemented it for another 1000 users outside our company on the same platform. Our challenges are mostly the complexity of the Softphone for end users and the stability of the Interaction Desktop. Real live view of all communication. Integration of SIP Softphone and Interaction Desktop is poor. Getting started with web based phone should be feasible with standard media servers, it stops us to roll out interaction connect. Standard reports in Business manager are subject to GDPR non-compliancy. It is well-suited for contact centers. It is less suited for people walking around, using VPN, etc. Genesys PureConnect Review: "Our PureConnect Story"
PureConnect is being used as our main telephone system throughout 27 countries. We use it for our business user and solution center agent. The all in one solution allows us the flexibility to deploy what we need where we need it. User Review: "My Experience with Genesys PureConnect"
It is our Contact Center voice solution with IVR, Call Back and Dialer. With the use of the dialer, we can increase the effectiveness of campaigns. Administrative areas, solution focused in areas of Contact Center. Absence of App for Android and IOS that allows the use of the corporate extension. The software is not compatible with Mac and Linux users, currently we have to resort to third party solutions, without guarantee of full operation. Appropriate for use of the IVR with integration in the CRM and the possibility of the client to have autonomy to perform consultations and interactions through API / REST. 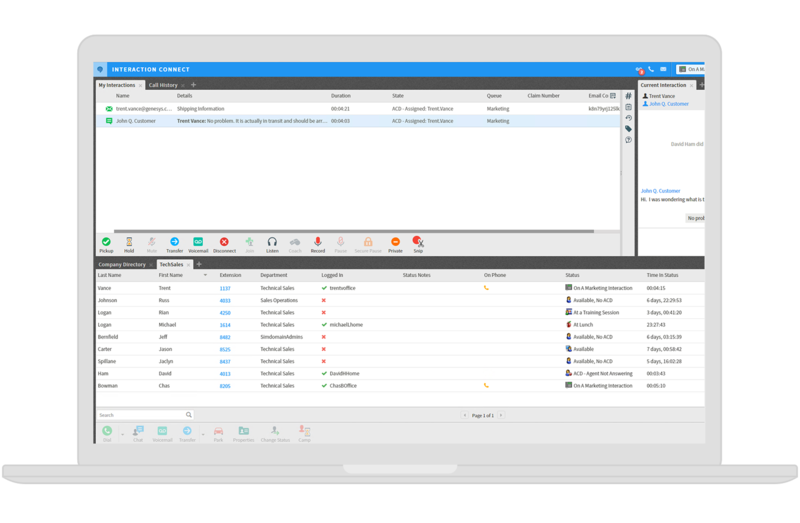 Genesys PureConnect Review: "PureConnect from a Trainer's Perspective"
We use it internally across the organization as it addresses TRUE presence management for our organization. Even through a recent acquisition, our legacy team still relies on Genesys PureConnect to stay in communication with one another. It displays another user's availability. As long as my co-workers keep their status updated, it is clear when I can contact them and when I shouldn't. It makes it super easy to have a conference call without disconnecting the other person in the process. The click and drag feature is my favorite thing! The flexibility of turning features on/off is great. I can customize my view of PureConnect for how I'm feeling that day. The widget that is used to move the views around is a bit tricky. Dragging a view is easy, but placing it in the widget correctly takes a few times to hit it just right. When adding new views, it can be tricky to find what you're looking for because some are buried a few clicks deeper than expected. Personally, I feel that PureConnect is better suited in larger organizations. If only 20 people are slated to use it, I don't think that's best. Particularly, if the organization has several floors in a building and/or have multiple locations, PureConnect is perfect for keeping connected. Genesys PureConnect Review: "Why PureConnect is not what you are looking for but might like"
We use PureConnect in help desk and a few remote stations across the country. We had problems with remote users before but PureConnect solved it. Integration with CRM system is easy. One server for all functions, not a whole farm of servers doing one thing only. This solution just need one. Reports are not perfect. We use some own SQL scripts to get what we want out of the system. I can log in to the system from my smart phone—no need to open my laptop just to log in and take calls. User Review: "Genesys PureConnect (my overview)"
Across all of Atos RTS. We have offices in Clovis, NM; Fargo, ND; Chengdu, China; Monterrey, MX; and Manila, Philippines. We use to as our VoIP solution. We've used the product prior to Genesys when it was called I3 and owned by Interaction Intelligence. ICBM is a strong component to the Telephony platform with its seamless monitoring inbound/outbound phones calls. The ICBM application also allows for the creation of quality assurance surveys that can be customized by the end user. ICBM also gives the ability to search and retrieve call recordings. The customization aspect via handlers is also a strength whereas my team has the ability to create modifications within the system to change the way calls are handled, change the IVR actions, etc. The Genesys technical support teams do a fantastic job at providing the support needed to resolve a large variety of issues/concerns that are encountered. Typically the team does a great job of keeping the consumer in the loop when tickets/incidents are raised. The Testlab site for validating products that work on the platform and also Windows Updates that have been tested is fantastic! This really helps out with teams that handle multiple facets of IT rather than just one aspect of it and it makes WSUS and Windows Update-related patching an absolute breeze because seldom does the uncertainty lie in whether or not a particular update will break operations on the platform. The licensing aspect of Genesys can be overwhelming from the perspective of someone taking charge of the process for the first time. The portal does a great job of showing bundled licensing, however, the support teams sometimes tend to fall short providing proper clarifications if any confusion is encountered whether it be with the licensing process, or with a particular licensing-related question. Typically, the licensing support team does pretty well, however, there are times where the issue or question needs to be restated in order to get a proper detailed answer to proceed. While the knowledgebase has greatly improved over the years, the community site forums still tend to present some struggles, specifically with keyword searches. While I realize it's difficult to really fully finetune community-based knowledge, it would be nice to see an indication of which particular posts actually include a valid resolution and which do not. I feel this would improve the quality of the overall community-driven self-support aspect/facets of the product. The biggest fall short aspect is the media servers. Specifically, that the support requirement is that they are to be physical servers rather than virtual ones. From a technical standpoint, this makes sense, however, from a business/cost savings standpoint, for a company wanting to move to SaaS or any virtualization, there will be support-boundaries herein that the media servers will always need to be on physical hardware. Genesys PureConnect has served Atos RTS particularly well in the aspects of customization. For example, there is the application known as Interaction Attendant, which is responsible for essentially building out the entire IVR through what are called "attendant profiles." Here we can drill into aspects such as audio messages/ACD-based transfers to workgroups. To further this though, customized handlers allow the ability to really take call handling to the next level. For example, it's possible to set a percentage of calls that will perform a specific action. This has helped greatly when our company decided to integrate an external entity for surveys that McDonald's stores would take after completion of a call. This allows the ability to define thresholds for what calls fall into what actions. In this scenario, we did a 50 percent that would external transfer upon call completion to this external survey entity and 50 percent that would not, built out a customized handler and even created a custom button inside of interaction desktop that the agents were trained on using to disconnect the call, which would initiate the custom handler and perform the transfer. All in all, the customization aspect of the product is a great strength. Genesys PureConnect Review: "The Ups and Downs to PureConnect"
It is used in the whole organization. It helps us to be more productive. It allows for automation of call routing which is more efficient than hiring somebody to manually do it. We are able to make internal calls easily by using interaction desktop instead of remembering specific extensions. Calls are done quickly by locating a name and calling from the computer. The product has a lot of aspects that require extensive training to use, which can be expensive for companies and challenging for employees. For this product you have to manage your own servers which makes upgrading the software more challenging than if it were a cloud based product. Working with Genesys is sometimes time consuming and getting to the root cause of an issues can be difficult at times. Genesys PureConnect is well suited for large call centers with the need for automation and managing call center agents. With PureConnect you are able to use the auto attendent to direct incoming calls to the appropriate place. Agents are also able to use a graphical user interface to easily make calls within the company and to external systems without the need for a physical phone. This product is not well suited for smaller business that just need an auto attendant or other simple phone connectivity options. Genesys PureConnect Review: "Amazing experience with Pure Connect"
We are a call center and we use for agents as well across of the organization. Upgrades sometimes are having issues and we find out after the upgrade. This situation implies to open a ticket with Partner/Genesys to get a solution and sometimes business needs sooner the fix. I would like to see a different tier structure to manage Interaction Administrator. We have a three tier structure and is a challenge to give some permissions to lower tiers without putting at risk some settings. One of the features that we use a lot is Dialer. The biggest advantage is the configuration because is well designed and you can change so many settings. For instance we are able to push 50 calls per second when we need too and have room to take inbound calls. Reports could be one of the weakest points of the system. This is because the "canned" reports work fine but customs are a challenge to create, so we have to relate to a different tool to accomplish it. Genesys PureConnect Review: "Happy customer"
The Genesys PureConnect is used across the whole organization by 6 different departments, each with a specific call flow and particular services. Also the traffic volume is relatively low compared to usual contact centers. Customer and employee experience improvement and quality assessment needs were the main driver for implementation and adoption of this product. User-friendly interface organized to naturally cover all of the most frequently needed and used cases. RDS access to client apps (TSRA). Management of access rights (bulk option missing). No option to export all configuration data in human readable form. Generally suitable in any scenarios except highly specific ones in which specific technical requirement can't be satisfied. Genesys PureConnect Review: "Great product with rich set of features and very stable performance"
B2B, B2C, HR & Service Ops users. Seamless interaction processing, highly configurable & complex intelligent routing of huge call volumes. Distributed platform architecture in a cloud - always operating within very high SLA. Reasonable API integration with other third party products such as Salesforce, Aspect, Nice, Nuance & more. Great genuine support & professional services offering solutions and customizations. Limited real time and WFM out of the box capabilities required additional customization and integration with third part products to meet the business operations. Somehow complicated licensing model limits the transparency on the actual usage in real time. Great dependency on Genesys engineering and development teams due to the restricted access to the distributed architectural components in the cloud. Web RTC capabilities are still lagging behind. Pros: It works efficiently with homeworkers & outsourcing partners who are using the same product. It has a rich features & tool set - easy to use as a single all-in platform. Cons: It is efficient for large complex customer service departments - less appropriate (too expensive) for smaller & simpler organisations. The real-time native chat application appeared to be quite limited (2017) compared to other products focused on this particular market niche. Genesys PureConnect - CIC is used by the whole company. It is our phone system. All calls are routed and answered in the PureConnect system, ACD calls are routed via the system. It addresses all of our phone needs; it is the way our company interacts with our customers via phone. We are leveraging PureConnect for calls, and voicemails. Their vast IVR routes call to the proper agents based on our needs, and the way we want it set up, very easily. The Genesys PureConnect system gives exceptional call center features. This tool has everything in one place, it is very customizable to meet each specific need. System changes can be pushed along to each agent at the same time, while each person can still make some of their own customized views. The call routing is very powerful and extremely customized. The ivr infrastructure is very good to meet each business need. Genesys PureConnect Review: "Best all-in-one reliable CC system"
The Genesys PureConnect system gives exceptional customer support center features. Its flexibility in customization and integration highly supports consumer satisfaction, as well as makes life easier for a company's customer agents due to its easy-to-use interface and functionality. The system makes it possible to have the basics for communications (e.g. call recording,) as well as complex things like real-time speech analytics, as well as IVR implementation. And all this can be done without any third-party integrations, which makes it an utterly useful platform. Nevertheless, the system is easy to adapt and integrate with other business systems. What's more, it's worth mentioning the Genesys genuine support team that is ready to assist anytime without counting the licenses we are occupying and paying for. Easy to use the PureConnect platform on any level, from administrator access, to the supervisor level, to the consumer level. Extensive functionality that provides an all-in-one environment for any related service - inbound, outbound, live chat, etc. Seamless integration with other tools such a CRM or BI. Genuine and supportive customer service team. Improved reports out of the system the ability to customize them prior to exporting. The lack of updates from Genesys proactively. Would be good if we could track all the bugs, bug fixes and updates going on Genesys' side. That would add some visibility to the overall environment and we could feel safer. Slightly improved live data improving. Coming from a platform where this was crystal clear, I sometimes miss the ability to see how the techs/agents are doing in real time. If you are looking at well and tightly integrated system, developed on a solid base, PureConnect is the way to go. At the end of the day, we look at the main root and code of the whole system which is being updated almost daily. When I look at all the integrations Genesys provides across its systems and platforms, I deem it a reliable partner. I'd say this system is well suited for the business that is extensively and rapidly increasing over time, as well as one that goes through constant transformations. Genesys systems can adapt to those changes due to its flexibility. The biggest advice to beginners with PureConnect would be to invest highly in training and in overall understanding of the business, as it might provide way more functionality and benefits than might seem at first glance. The Genesys PureConnect platform is an all-in-one contact center solution that promises a broad and deep set of omnichannel and business communications solutions on a single platform. The vendor aims to offer: simplified all-in-one architecture, flexibility and the highest level of isolation and control available in the cloud. Available both in the cloud and on-premises, PureConnect promises to let you replace multiple point solutions with a single application that makes customers and employees happier. Do more with less: An all-in-one platform enables you to deliver a better customer experience while greatly simplifying administration, increasing operational performance, and reducing total cost of ownership. Speed time to value: A single set of broad and deep solutions allows you to turn on new capabilities quickly, when you’re ready, and new functionality is built right into existing interfaces. Tailor solutions and protect investments: An open, standards-based architecture allows you to customize the application and integrate with any existing systems. Maximize privacy and control in the cloud: You get your own instance of the application, the option to go 100% private cloud and the ability to keep voice traffic and recordings at your site. You can also customize solutions, determine the timing of updates and maintain control over carrier relationships.